This page is about the rock group, Crowded House. For their debut album, see Crowded House (album). Crowded House are an Australian rock group. They formed in 1985 in Melbourne, led by New Zealand singer-songwriter Neil Finn. Finn is the main songwriter and creative director of the band. He has led it through several changes. The band has people from a few different countries: from New Zealand (Neil and his brother, Tim Finn and Eddie Rayner), Australia (Paul Hester, Nick Seymour, Peter Jones and Craig Hooper) and the United States (Mark Hart, and Matt Sherrod). 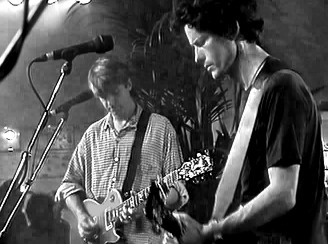 Crowded House are referred to as The Crowdies by Australian fans. 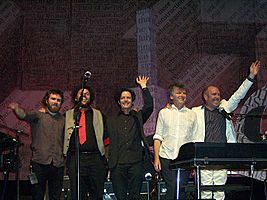 Originally active from 1985 to 1996, the band has had consistent commercial and critical success in Australia and New Zealand and international chart success in two phases, beginning with their self-titled debut album, Crowded House, which reached number twelve on the US Album Chart in 1987 and provided the Top Ten hits, "Don't Dream It's Over" and "Something So Strong". Further international success came in the UK and Europe with their third and fourth albums, Woodface and Together Alone and the compilation album Recurring Dream, which included the hits "Fall at Your Feet", "Weather with You", "Distant Sun", "Locked Out", "Instinct" and "Not the Girl You Think You Are". Founding drummer Hester left in May 1994, citing family reasons, but returned for their Farewell to the World concerts in Melbourne and Sydney in 1996. Neil Finn had decided to end the band to concentrate on his solo career and the Finn Brothers project with Tim. On 26 March 2005 Hester died, aged 46. In 2006, the group re-formed with new drummer Matt Sherrod. They have since released two albums, which have both reached number one on Australia's Album Chart. The new albums are called "Time on Earth" (2007) and "Intriguer" (2010). Crowded House Facts for Kids. Kiddle Encyclopedia.